Minutes before kicking off the third of four sold-out performances of his laser-driven audio-visual show, Lumière II, Robert Henke took to the stage to deliver a few brief words to the audience. To paraphrase: “It’s critical that you turn off your phones during the performance,” he began. (No surprises there.) “But I know you want to take photos and videos of the show, and it’s good publicity for me. To accommodate you, after the show I’ll perform a short encore during which you can take as many pictures as you want.” (A brilliant solution to a very contemporary problem.) “Additionally, I must insist that, for your own safety, no one may throw any kind of reflective object into the air during the performance.” (Wait, what?) It was definitely not your usual safety disclaimer, but then again, Lumière II was not your usual performance. I had the pleasure of seeing Lumière in its original incarnation last year at MUTEK in Montreal. Then, as now, I left with the feeling that I’d witnessed something entirely new. Lumière II is not a concert or a light show. It’s somehow both, and more. Robert Henke’s work, with Monolake and Ableton especially, has always felt future-minded, like an exploration of the possibilities of technology as a medium. Lumière II is the physical manifestation of this impetus. These four showings took place at The Grand Theater in San Francisco, a historic movie theater revitalized by Gray Area Foundation For The Arts and Recombinant Media Labs. The space is a blank canvas, an art deco cavern featuring an enormous rectangle where a movie screen once lived. If music is the spirit of Lumière II, then lasers are its skeleton, and billowing clouds of fog its flesh. The work begins gently with an atmospheric soundtrack and scrolling blocks of lasers, gradually building in intensity until the climax, a heart-stopping, unexpected event marked by the first noticeable appearance of color (blood red) in the work. 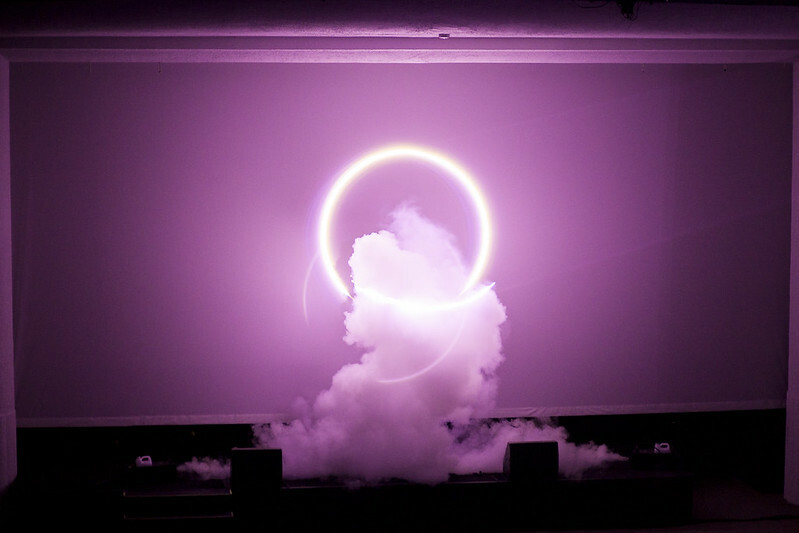 Anyone who has been to a club knows that lasers and fog go together like peanut butter and jelly, but Lumière II goes a step beyond, using judiciously timed clouds of fog to add a sculptural element to the work. With the fog machine in high gear, the work became three-dimensional, depth perception became impossible, my eyes lost focus, and I became totally submerged in the audio-visual blitz happening around me. If I have one criticism, it’s that I wished it had ended ten or fifteen minutes sooner. After the climax, I found myself becoming antsy, partially from sitting down for so long and partially because Lumière II aims to overload your senses, and it is very effective in that regard. Regardless, I left feeling invigorated and in awe of what Henke had accomplished. For right now, Lumière II is one of a kind.